By Wesley Fenlon on Nov. 19, 2013 at 11 a.m. Both popular 7-inch tablets have better color gamuts and contrast ratings than the iPad Mini. They're also more power efficient and less reflective. The iPad Mini with Retina has arrived, and that means it's time for another DisplayMate tablet shoot-out. 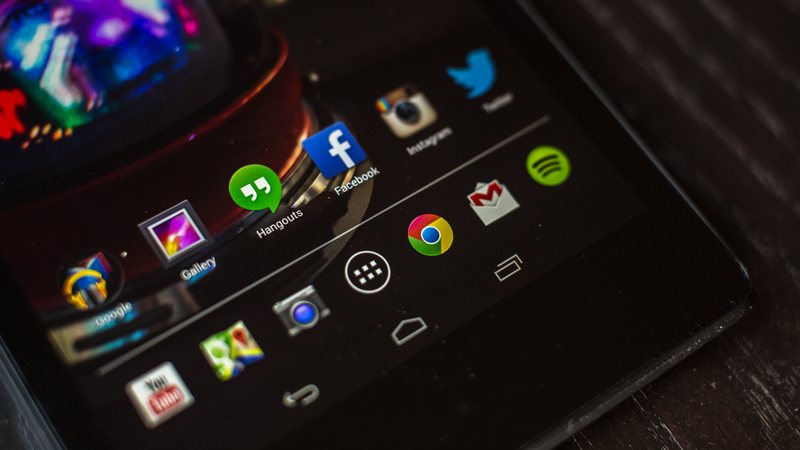 The Mini's competitors are Google's second-gen Nexus 7, refreshed in July, and the latest Kindle Fire HDX 7, refreshed in September. Both the Kindle Fire and the Nexus 7 cost $230, while the iPad Mini with Retina is much more expensive at $400. But DisplayMate's shoot-outs don't have anything to do with app ecosystems or prices or what's going to sell the best this holiday season. They're all about the screens. All three tablets go beyond 1080p in resolution--1920x1200 for the Android tablets, and 2048x1536 for the iPad Mini. Resolution isn't everything, however, and even though Apple kicked off the trend of high density displays in mobile devices, DisplayMate has found them lagging behind with the Retina Mini. It had the worst screen of the bunch. "Two innovative Tablet manufacturers, Amazon and Google, have significantly leapfrogged Apple by introducing Tablet displays using LTPS (in the Kindle Fire HDX 8.9 and the new Nexus 7), and they are significantly outperforming the IGZO and a-Si displays in the current iPads," DisplayMate writes. "Apple was once the leader in mobile displays, unfortunately it has fallen way behind in both Tablets and Smartphones. This should be a wakeup call…"
LTPS and IGZO are two important pieces of transistor technology that are used in displays. We wrote about them recently. While IGZO is better than the traditional amorphous polysilicon used in many displays, it's not as good as LTPS, or low-temperature polysilicon. The problem with LTPS technology is that it's more expensive, and difficult to implement in devices with larger screens (tablets, as opposed to smartphones). However, both Amazon and Google have managed to get LTPS technology into tablets--the Kindle Fire HDX 8.9 and Nexus 7, respectively. Amazon's 7-inch Kindle Fire actually uses another technology, which we'll get to in a second. As DisplayMate summarizes: "Amazon and Google, have significantly leapfrogged Apple by introducing Tablet displays using LTPS...and they are significantly outperforming the IGZO and a-Si displays in the current iPads. Apple is now lagging in displays, an area where it was once the leader." 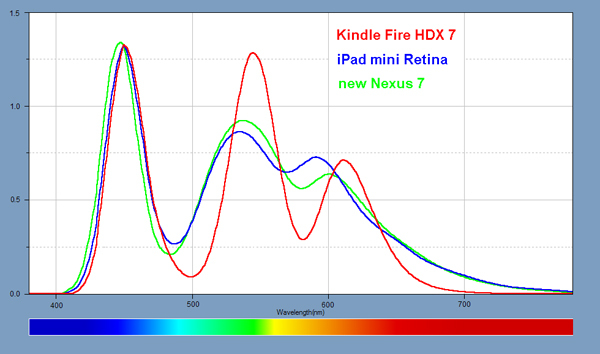 Kindle Fire HDX 7 color saturation: Serious business. 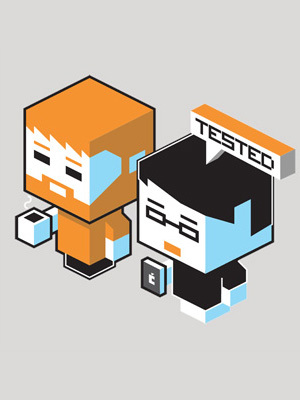 Image via DisplayMate. Quantum dots "produce highly saturated primary colors that are similar to those produced by OLED displays. They not only significantly increase the Color Gamut to 100 percent but also improve the power efficiency at the same time. Instead of using White LEDs (which have yellow phosphors) that produce a broad light spectrum that makes it hard to efficiently produce saturated colors, Quantum Dots directly convert the light from Blue LEDs into highly saturated primary colors for LCDs...Quantum Dots are going to revolutionize LCDs for the next 5+ years." 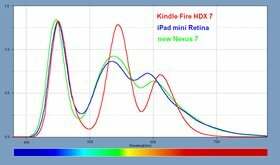 Amazon's working with some high tech stuff with the Kindle Fire HDX 7, but based on DisplayMate's charts, the Nexus 7 performs nearly as well when it comes to color gamut and accuracy. It even scored slightly higher marks for contrast, black levels and screen reflectance. Best of all, it won out on power usage, drawing only 1.8 watts at max brightness compared to the Kindle Fire's 2.3 watts. While Apple still has a good display in the iPad Mini with Retina, Android's rapid advancements have easily surpassed it. Other than size, a smoother gamma scale, and an unnoticeable edge in pixel density, the iPad Mini falls behind the great displays in both $230 Android tablets. If you buy either one, you're not going to be disappointed by the screen. Check out DisplayMate's full comparison for charts and graphs galore.